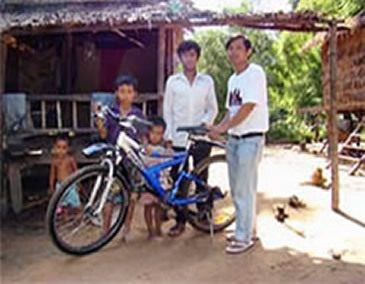 On 29th May 2009, Cambodia Cycling has donated a mountain bike, GIANT Rock6000 21 speeds, to the kids in Don Oeuv village in order to encourage the kid to continue his study at junior high school. With this bike, Pran will be able to go to school located 8km from his home. 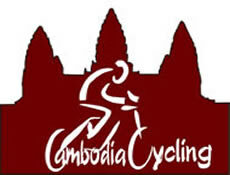 Cambodia Cycling strongly believes in education. 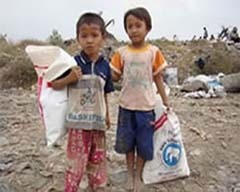 Cambodian children have the same rights to access education so that they will have better future. On 03rd February 2009, Cambodia Cycling team has donated 3 computers (2 desk tops and 1 laptop) to to Khmer Society and Culture Promotion Organization (KSCPO) at Steung Meanchey Pagoda. The organization is a small community based NGOs run by the monks to help people living with HIV/AIDS at the outskirt of Phnom Penh city who their children go to pick up plastic at the rubbish collection site and cannot afford to go to school. The monks work with 128 families who parents have got HIV/AIDS. Some kids have only mothers after their father have passed away. 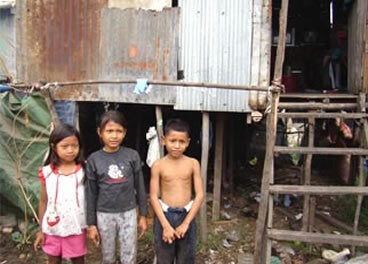 It is really hard for the ladies with 4-6 children to survive. The monks also help to teach their kids with HIV positive English. Some of the older kids are hunger to study computer which provide them better opportunity to find job.